earlier this month, sam started drawing things that actually look like stuff. well, when it comes to trucks anyway. i can't recall any evidence that he can draw things other than trucks (unless you count cars), but i'm still pretty impressed. in other news, i finally took the time to hang up sam's rotating art gallery. it will feature new drawings by the artist on a semi-quarterly basis, or whenever i get around to changing the pictures. 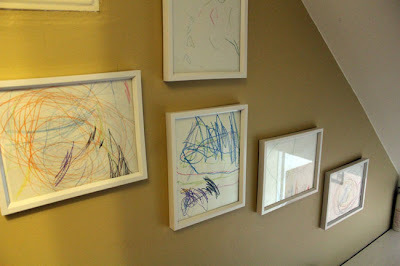 he's quite prolific, though his medium of choice seems to be the magna-doodle (which has saved lots of paper and wall space).